I have a new plate holder, but need the hardware, the clips, to attach to the bumper fairing underneath. Honda won't sell just the hardware. 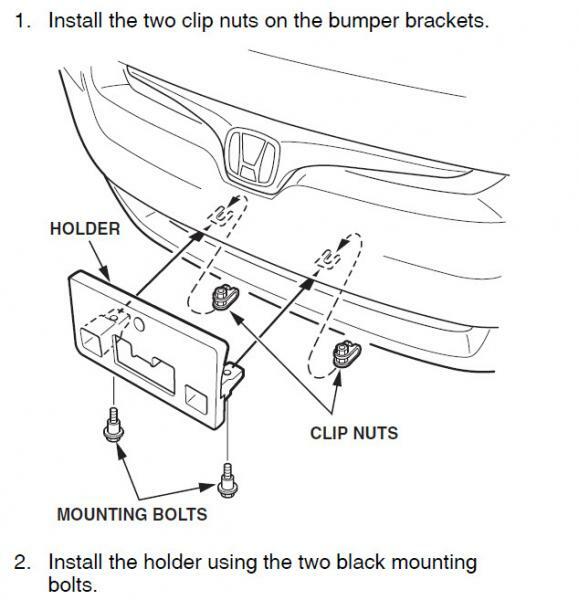 Would love to hear any suggestions to get these clips, so I can attach my license plate. That #26 looks right for the two clips to attach license holder to the frame. Right? And the other ones you are mentioning are to attach the plate to the plastic holder? 26 are "nuts" that clip onto the bumper, then a bolt, #21, goes through the bracket you have and into the nut. See if this pic helps it make more sense. Then you use self tapping screws #33 to install the top part directly to the bumper. Then use #33 or #34 to mount the plate itself to the base. FYI: I haven't done this on a Fit. I'm just going from my experience on other cars and the parts diagram to guess what is going on. I think this is correct. I couldn't figure a way to order from your link. Do I need to go somewhere else? That's Honda's site to let you look up part numbers. You can take those numbers to your dealership to order parts. You can also order online from various places (hondaautomotiveparts.com, bernardiparts.com) which are also dealerships that do online business. Typically on cheaper parts like that, the online dealership has a lower price on the part, but they hit you with shipping and handling fees that make it not worth it. Your best bet is to just go to the dealer -- they probably have those items in stock or can get them the next day for you. Thanks, Helios. I will pursue this. The closest Honda dealership is 40 miles away. Did you get what you needed? I just moved to FL and do not need the front mount, let me know. Relay or Fuse or Headlights?